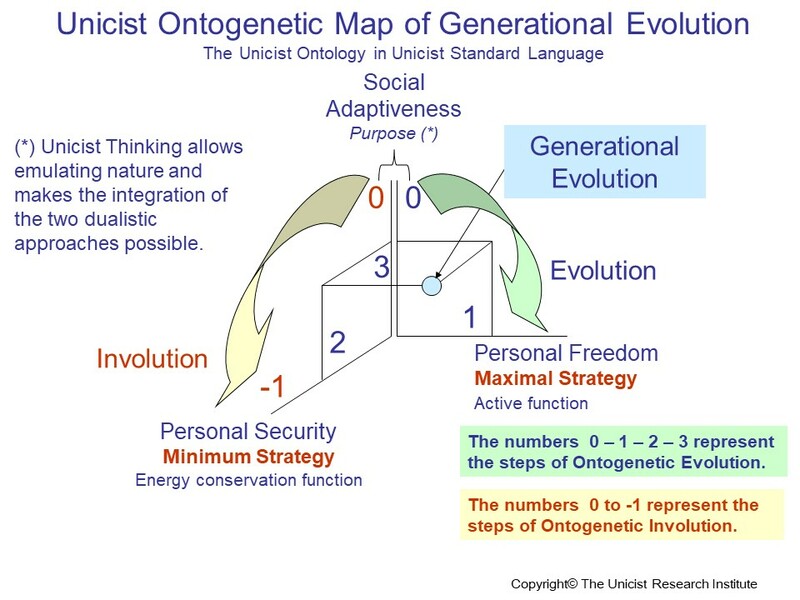 The objective of the research on transgenerational evolution was to find the drivers of evolution and involution of people in their environments and discover the multiple pathways evolution opens for those who are involved in it. The goal was to find how to influence the evolution of people, groups and cultures. This research, that has been just finished, began in 1976 at The Unicist Research Institute and was led by Peter Belohlavek. The research made evident that the evolution of people, groups and cultures cannot be forced it can only be catalyzed using elements included in the restricted context. The collective intelligence of the family and the collective intelligence of the environment strongly influence the evolution of people but do not establish deterministic patterns. What was found is that adolescence establishes a branch in evolution which is sustained by the collective intelligence of the restricted and wide context and is based on the action guide children have internalized during their childhood. This opens multiple structural alternatives that, on the surface, have infinite operational alternatives. The goal of the research was to find the essential drivers of transgenerational evolution to be able to install catalysts in the educational system that foster evolution and minimize the trends towards involution. This research began in 1976 and was a parallel process to the research on social evolution, the roots of human intelligence, fallacies, and human learning processes. It included the study of the evolution of people for more than 30 years. The goal was to find the fundamentals that drive evolution and involution and testing the use of different catalysts to evaluate their functionality. Cultural changes occur along multiple generations and are catalyzed by technological changes. The discovery of fire, the wheel and gunpowder are examples of how cultural change is driven and catalyzed by technologies. These changes begin being operational and end being part of the collective intelligence of the culture. Therefore, the introduction of structural changes in cultures requires, necessarily, having a transgenerational approach to evolution. It requires understanding the fundamentals of the behavior of the coming generations to define the framework to introduce structural changes, knowing the need for change that exists and having catalyst that allow sustaining the need for such change. This evolutionary approach needs to be based on the responsibility of the elites to provide the necessary framework for the evolution of societies and the middle-classes sustaining the evolution to ensure that the whole society evolves towards a superior level of wellbeing. The present generation of a culture should provide an evolutionary framework for the evolution of the following generations but is not responsible for their evolution. The adoption of one of them depends on the collective intelligence of the environment of individuals at the time of their adolescent rebellion and on their capacity to deal with the external influences. It has to be considered that the perception of the environment is subjective, which means that two individuals in the same environment, at the same time, might have an “opposite” perception. Nevertheless, the collective intelligence, the fallacious myths of an environment and the cultural archetype strongly influence the adoption of one role or the other. In these adaptive contexts, the competition adopts multiple shapes and is sustained by the existence of discriminated relationships with the predecessors, parents or authorities, in a framework of unconditional affection. Adaptive evolution generates sustainable growth. Competitive role driven environments generate evolution. This competition is basically driven by evolution conflicts, innovation conflicts and negotiation conflicts. This generates the need of having the guidance of a “greater good” to be achieved. This greater good is the catalyst that makes evolution possible. Based on the achievements of a group or society, these competitive environments generate economic and social upgrades for their members. Adaptive environments are necessarily participative, technology-driven and growth-driven and generate a spirit de corps that makes them influential. 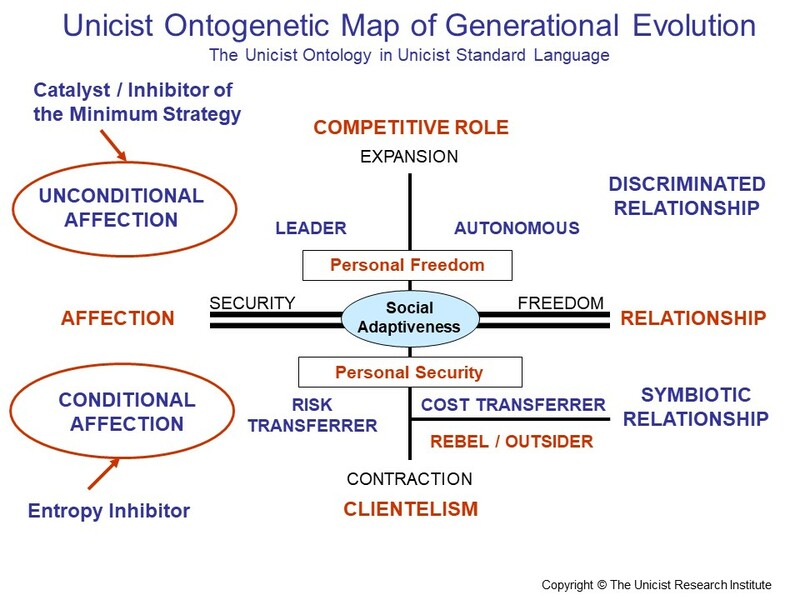 When individuals from the “new generation” are driven by an over-adaptive framework, they adopt clientelism and expect paternalism to sustain their place by attacking the implicit weaknesses of the strengths of the preceding generation. They guarantee their role based on the fact that implicit weaknesses are an intrinsic part of the strengths and cannot change. Based on this fact, they feel they have the right to demand from the preceding generations and having the need to “pay” for it. Clientelism is driven by a symbiotic relationship, which is the “price” the new generation believes that it is paying. It is sustained by conditional affections, which are based on recognizing people for what they “feel” they do and not what they actually do. Over-adaptive evolution generates conflictive frameworks. They basically generate power conflicts, involution conflicts or those which are the consequence of the avoidance of existing functional conflicts. Over-adaptive environments organized as groups, organizations or societies develop towards paternalism and clientelism. Paternalism defined as the system, principle, or practice of managing or governing individuals, businesses, nations, etc., in the manner of a father dealing benevolently and often intrusively with his children. Paternalism implies clientelism, which implies “buying” the will of people. Political clientelism is the exchange of goods and services for political support. Paternalism and clientelism naturally generate a subjectivist environment where the subjective relationships prevail over the functional relationships and generates value judgements as a defensive action developed by the clientelism driven people. Paternalism & Clientelism are integrated with Facileness. When this integration becomes stable, facileness becomes an addiction of an individual, group or culture.